Andesine is a Pagioclase Feldspar. The natural colors of natural Andesine range from pink, yellow, copper, and green. The clarity can be transparent to translucent. Andesine has a Mohs' hardness of 6-6.5. Density 2.65-2.69. Triclinic (Na,Ca)(Si,Al)2 Si2 O8. Andesine is mined in many locations around the world. The Vivid reds, red orange, Green, and Bi-colored that have been in the market since 2001-2002 have been said to come from The Democratic Republic of the Congo. China, Mongolia, and Tibet. The reality is that No westerner or respected gemologist has been able to inspect the mine where The vivid colored andesine are said to originate from. There is a group of respected people in the gem trade that have claimed to have visited the mines in Tibet in 2010 with color photos of the rough and pictures of the site, with a full story of their findings and their harrowing trip stating that Tibet was the real source of andesine. This prompted other gemological experts to visit the mine where they came to the conclusion that the mine was salted with andesine and that the samples they had collected showed signs that the andesine had been heat treated with coloring agents to enhance the color. Anyway there are numerous articles written on andesine that can be accessed through a google search. Back in 2001-2002 when andesine was first introduced at the Tucson gem show the color variations were quite prominent in the andesine being sold, as should be with any natural un-treated gemstone. None of the dealers had rough specimens for sale though, only cut stones. This raised some doubts among the gem professionals. Andesine was toughted as being rare and 100% natural with no treatments. In the beginning there were dealers who stated their andesine came from China and other dealers who claimed their andesine came from the Congo. The supposedly Congolese andesine was a more vivid brighter colored material. As time went on andesine became a rock star in the gem world and prices went up. The major labratories who recieved andesine for a gemological testing would issue reports stating that the andesine inspected was natural and un-treated. 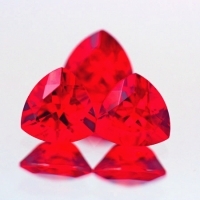 By 2007 prices on vivid red or orangish red andesine in fine grade were selling for $100-$125 USD per carat for stones 1 to 3 carats, $120 to $140 per carat for stones 3 to 5 carats and $200 to $250 for gems 5 to 8 carats. By 2007 and 2008 what was supposed be a very rare gemstone that could vanish from the gem world at any moment seemed to be available every where in very uniform colors and cuts. The color and cuts were so uniform that this raised more red flags. After the 2008 Tucson show there was alot of exstensive testing done by labratories around the world and it was determined that the vivid colored andesine had been Difission treated to enhace the color in the stones and that dealers who sold andesine should immediatly state that their andesine was diffusion treated. Anyway Red andesine is a very beautiful vivid gemstone that is mined from the ground and then color enhanced by a complex diffusion process that is a secret. Companies who do diffusion on other gemstones as a living have attempted to duplicate the difussion process and have not been able to duplicate the process that was used on the adesine that made it a well sought after gemstone. There are 9 of these fine gems in stock. CLEARANCE SALE!!! !